It almost wan’t even surprising. The red line here plots Republican / Democrat cooperation, as measured by the polarization of voting patterns in the House of Representatives. 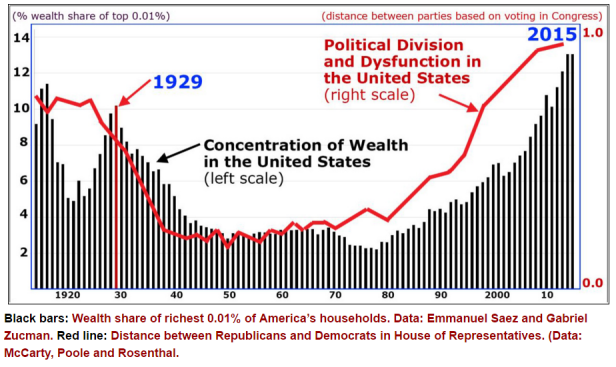 It’s not a perfect proxy for US political dysfunction, but it will do for the moment (see here for the details), and it doesn’t require you to buy into any sort of fake left/right symmetry (as if the Democrats were equally responsible for the state of the American polity) to see just how strong the correlation between inequality and political dysfunction can be. Nor do you have to be American to see how dangerous the situation is becoming. The political-economic and cultural stress is reaching terrifying levels all over the world, and we haven’t got a chance of managing it – and getting past it in one piece – without inclusive economies and well-functioning governments. Capable governments that are able to plan, effectively and well. Governments that can plan infrastructure transitions, or at least repair bridges. Governments that protect the weak from the winds of globalization, or at least respond when hurricane winds tear their cities. Governments that can pass, and legitimate, progressive tax systems. Governments that, in a world addled by neoliberal ideology, are now rare. That’s the good news. The bad news is that 1.5°C is probably out of reach, and that even 2°C will be very, very hard. And that there’s not a snowball’s chance in hell that we’re going to make it through the greenhouse century without high degrees of resolve and strong institutions of cooperation, institutions that function both internationally and within nations. And given the accelerated pace of the recent warming, that cooperation had better start very, very soon. This is a chart of global mean surface temperature anomalies over time. 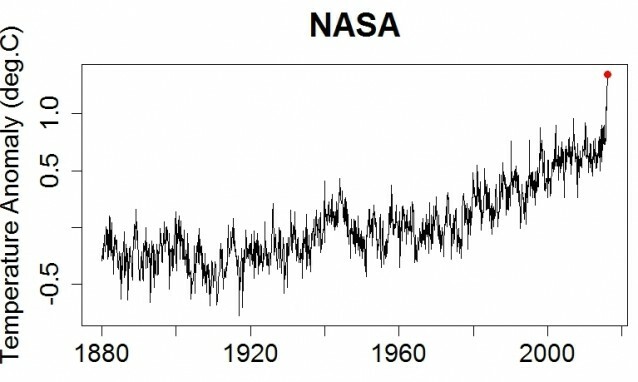 It’s NASA data, and is relative to the average 1951 to 1980 temperature. It shows a warming of 1.35°C for Feb 2016 (the red dot). What we want to do here is compare that Feb 2016 number to the Paris Agreements text (just above), the one that says that we will pursue efforts to limit the temperature increase to 1.5°C above pre-industrial levels. The complication is that the Paris goals aren’t relative to 1951-1980 period, but rather to “pre-industrial” temperatures. This, fortunately, is an easy correction to make. Jim Hansen (see page 7 in this March 2016 journal article) gives the correction at 0.3°C, which gives us a whopping 1.65°C above the average temperature for the month of February. Which, you will notice, is larger than 1.5°C. So February was already warmer than 1.5°C. Which is not to say that the year 2016 will be – it won’t – but very much is to say that something is happening. Something bad. Which is why it’s critical to understand that, while Paris was a big step, that’s all it was. And that the fundamental problems of deep and rapid decarbonization in a high-inequality world are going to make the next steps difficult indeed. In fact, we’re probably not going to be able to take them, not fast enough, unless reducing the polarization is part of the deal. You shouldn’t write anything like this without being worried about being discouraging. Discouragement, after all, is itself a danger, and a big one. But I decided to go ahead, for two reasons. The first is that I don’t see how we can be partially reality based. The second is that I believe that there are still paths forward, albeit only high technology, high cooperation paths. This means, to me, that we have to face some terrible truths. One of them is that it’s going to take everything to keep the warming below 2°C, including luck. Another is that, even with luck, we’re not going to make it without cooperation, hard and robust cooperation. And we’re not going to get that cooperation in a world where 1% of the people own 50% of everything.